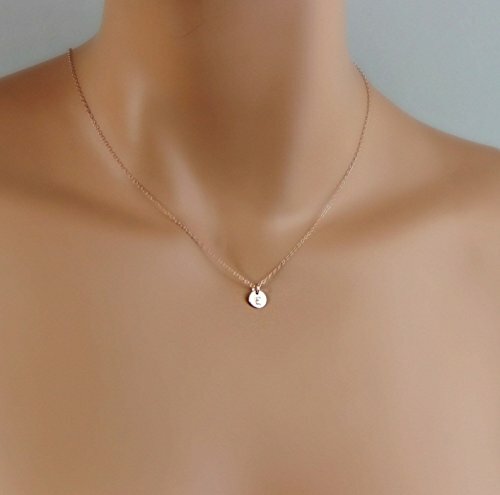 Tiny Rose Gold Initial Necklace, Dainty Monogram Charm Trendy Jewelry, Bridesmaid Gifts, Flower Girl, Personalized Minimalist Necklace ................ Great simple necklace for everyday or a gift for family and friends. This necklace can also look good with other necklaces for a layered style ...................................... Thick XSmall size TINY charm (approx. 7mm) ...................................... All metal setting is high-quality solid 925 Sterling Silver, 14K Rose Gold fill or 14K Gold Filled for quality heirloom not plated or vermeil (is hypoallergenic, safe for sensitive skin) and made in USA or Italy, will last for years with proper care. ...................................... Jewelry will come in a beautiful package, ready for gifting ...................................... Handmade, handcrafted in the USA ...................................... First sample picture: Option "Rose Gold 1 custom disc" - Texture: Shiny - Letter: E - Font #3A - 16"
Small Circle Layering Necklace: To have the same look as pictured (top disc offset, bottom disc in the center), this can only be made as one necklace. We can also make two individual necklaces (the discs had to be in the center) OR one necklace but the discs in the center upon request when checking out ............................... Thick Small size disc...... approx. 3/8"OD ............................... All metal setting is high quality solid 925 Sterling Silver, 14K Rose Gold fill or 14K Gold Filled for quality heirloom not plated nor vermeil (is hypoallergenic, safe for sensitive skin) and made in USA or Italy, will last for years with proper care ............................... First sample picture: Top chain end to end length is 16" ............................... Initials: L, A - Font: #3A - Texture: shiny ............................... The total length you select will be for the shortest/top necklace is including the disc then other necklace will be spaced accordingly. ............................... PLEASE NOTE: wearings layered necklace may cause the chain twist, make sure the chains are not twisting before you put them on. 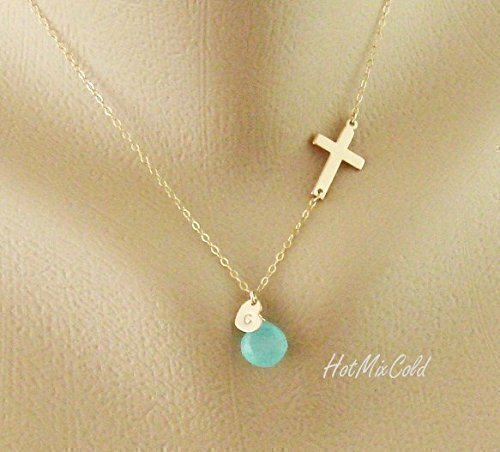 Personalized Monogram Sideways Cross Necklace, Initial Heart Charm Necklace, Birthstone Jewelry, Blessed Necklace, Mother Necklace. Very simple yet timeless necklace for everyday or birthday's gift .................... Cross charm (approx. 0.82"H x 0.5"W) .................... Hand-stamped Tiny Initial heart charm (approx. 5/16"H) .................... Natural Gemstone/ Birthstone or Swarovski crystal of your choice. (#27 is the stone shown in the picture and it's NOT TURQUOISE Stone.) .................... High quality 925 Sterling Silver or 14K Gold filled for quality heirloom not plated/dipped nor vermeil (is hypoallergenic, safe for sensitive skin) and made in USA or Italy, will last for years with proper care ...................................... Jewelry will come in a beautiful package, ready for gifting ...................................... Handmade, handcrafted in the USA ...................................... End to end length is the total length. 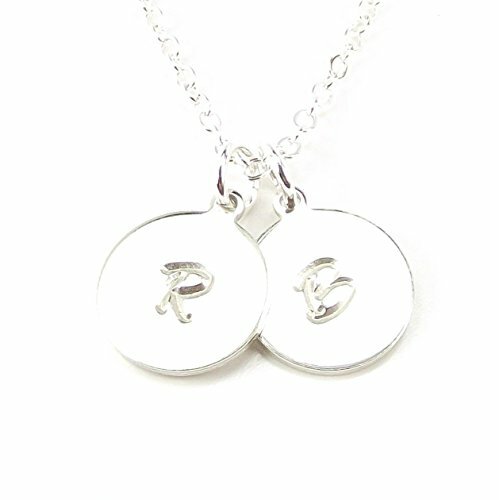 LaFenne Handmade in USA, this delicate necklace is made by custom stamped initial disk charm and 18" silver plated brass necklace. Perfect necklace for layering, bridesmaids gift, birthday gift ..etc. 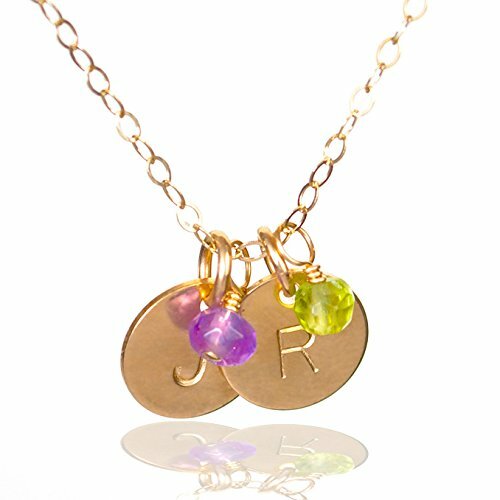 Hand stamped uppercase initial of your choice onto 1/2" disk charm. 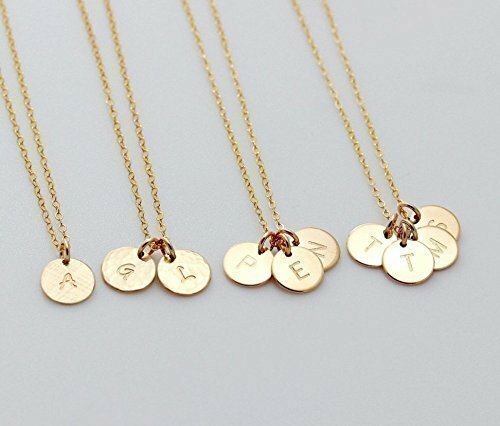 Choose up to 5 initial charms per necklace. 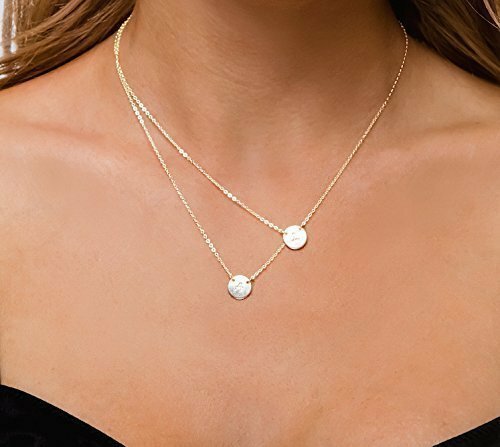 Minimal, simple initial circle charm necklace, personalized or blank with hammered textured in 925 Sterling silver, 14k Rose gold filled or gold filled, perfect mothers necklace or sister jewelry ............... Choose 1 2 3 or 4 charms to engrave with any letter, symbol or character with the texture of your choice ...................................... If you need more than the quantity listed, please contact me ...................................... Thick Small size disc........approx. 3/8"OD. ...................................... All metal setting is high-quality 14K Gold Filled, 925 Sterling Silver or 14K Rose Gold filled for quality heirloom not plated/dipped nor vermeil (is hypoallergenic, safe for sensitive skin) and made in USA or Italy, will last for years with proper care ...................................... Jewelry will come in a beautiful package, ready for gifting ...................................... Handmade, handcrafted in the USA ...................................... End to end length is the total length. 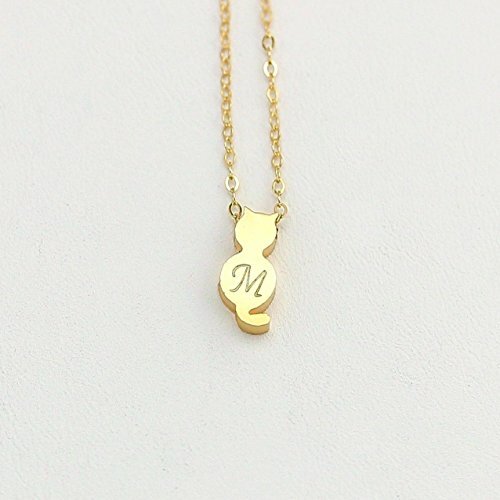 Personalized Cat Necklace, Initial Cat Necklace - Personalized Stamp Monogram Cat Jewelry, Double-sided GOLD or Silver Cat Engraved Charm Necklace, Cat Lover ....... What an adorable necklace! It's a great gift for a cat lover or for yourself ...... 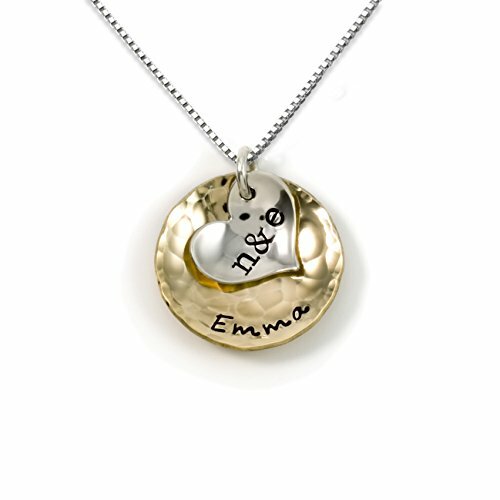 Choose Blank or personalized with any initial, number or symbol. ................................... Matte Rhodium-plated/dipped, matte gold plated/dipped or Matte Rose gold plated/dipped tiny cat - approx. 0.5"H (12mm) ................................... First sample picture: - "Gold stamp 1 cat" option - Letter M - Font #31A - Plain .................. NOTE: the pendant will slide along the chain and not stationary. The Gold and Rose Gold pendants are plating/dipped, therefore, the color may wear off over time depends on the air element and body pH. 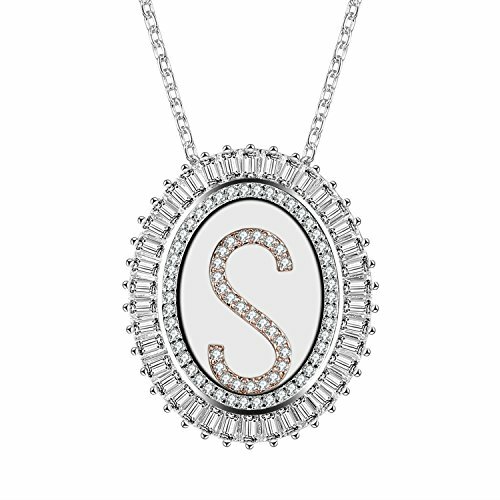 Caperci Oval Two-Tone Cubic Zirconia Alphabet Initial Letter S Pendant Necklace for Women, 18"
Make an original initial charm using rubber stamp. PMC is fine silver in the form of a clay. Find a stamp of your favorite design and you can make a fine silver accessory exactly with that design using PMC. 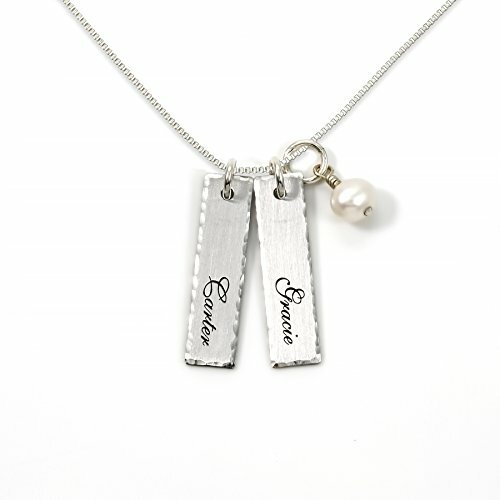 Compare prices on 2 Charm Initial Necklace at ShoppinGent.com – use promo codes and coupons for best offers and deals. Start smart buying with ShoppinGent.com right now and choose your golden price on every purchase.